The AnyLoad AMF-F load cell feet are constructed with alloy steel with plated finish, and they have a large removable rubber elastomeric cover. This cover helps to ensure that the weighing system is stable by eliminating trembling and sliding. These load cell feet are available as AMF-F-1/2, AMF-F-3/4, AMF-F-1, AMF-F-M12, AMF-F-M18, and AMF-F-M24. 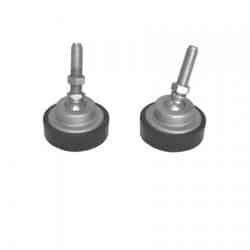 In addition, these load cell feet have a swivel design and are adjustable in height. The top of the threaded studs of the AMF-F load cell feet are specially designed to allow easy installation. Furthermore, these load cell feet are optimized to provide suitable load cell loading conditions. The AMF-F load cell feet are commonly used in floor scales and platform scales. Other capacities and configurations available – please contact us with any questions about our swivel leveling feet. ANYLOAD active load cell mounting feet are made of hardened alloy steel with a plated finish and are equipped with a large removable rubber elastomeric cover. To allow for easy installation, the top of the threaded stud has been manufactured with a 10% reduction in diameter. The AMF swivel leveling feet are adjustable in height and have a swivel design with an active ball that provides ideal load cell loading conditions.